Who'd have thought I'd be cosying up to the Danes for lessons on how to cheer up? With terrorism escalating and constant images of suffering and pain, 2016 has turned into a particularly awful year. It's no wonder this is the year that will end with everyone talking about the Danish concept 'hygge'. Hygge is being hailed as the new wellness trend and because it originated in the world's happiest nation, Denmark, we should sit up and listen. The hygge concept of living 'cosily' is one that the world is already beginning to embrace with open arms. Perhaps it's because we're all a little sick and tired of hearing how we should only be eating raw food, running marathons and drinking nothing but water. Our diets should be gluten free, dairy-free, sugar-free . . . everything you end up eating tastes like cardboard and you can't even have a glass of wine to wash it down with. You feel like a criminal if you order a slice of cake in a coffee shop. People's heads spin around to stare: Who in the name of God ordered actual cake? Do they have a death wish? They shake their heads as they piously tuck into one of those raw energy balls that frankly taste like they're made of straw and out-of-date coffee with a bit of kale thrown in as a 'treat'. People are fed up. Life is tough. Everyone is worn out. They want comfort, treats, something to look forward to, something to take their minds off their worries and stresses. It seems the Danes have the answer. Studies have been done to try to explain why Denmark keeps topping the world happiness poles. Their social security, equality, wealth and tolerance are obviously big factors but the problem with that explanation is that it doesn't set Denmark apart from the other Nordic countries. Apparently, it's hygge that sets them apart. Meig Wiking - the chief executive of Copenhagen's Happiness Research Institute (yes, they have a Happiness Institute!) - in 'The Little Book of Hygge', says the hygge trend is the antithesis of the clean-living books that have dominated best-seller lists for months. "Hygge is about embracing things - enjoying cake, not checking work emails all weekend, spending time with friends and family. It's about the simple, small pleasures that make life great, which perhaps sometimes pass us by." The concept of hygge means creating a warm atmosphere and enjoying the good things in life with loved ones. Eating dinner around the warm glow of candlelight is hygge. Spending quality time with friends and family, drinking wine in front of a roaring fire, watching the sunset - these are all hygge. Even during the long dark winters the Danes don't get down. They 'hygge' their way through. The pinnacle of hygge is Christmas, when the Danes really push up the hygge levels. As the days get shorter and darker, millions of candles are lit all over the city of Copenhagen, giving it a magical feel. Candlelight is very hygge. Danes burn more candles per head than anywhere in Europe. 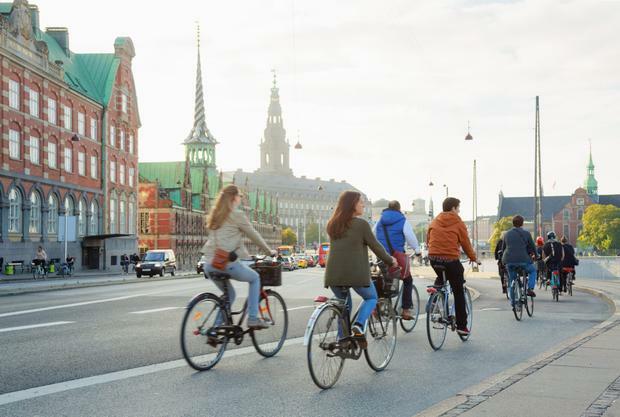 Visitors to Copenhagen can do a 'Hygge and Happiness half-day tour' around the city, which includes coffee and beer. Wiking says the Danes like to talk about hygge things that they are looking forward to, appreciate something hygge when it is happening and talk about what a hygge time they have had afterwards. "An important thing to remember when it comes to understanding hygge is that it's about experiences rather than 'stuff'," he says. Hygge is taken so seriously in Denmark that doctors regularly prescribe "tea and hygge" as a cure for a cold. In the bleakest month of the year, January, when Irish people are queuing up to join gyms, swearing off alcohol for life and stapling their mouths shut so they can lose weight, the Danes are being kind to themselves. And because of hygge, they don't feel the need to binge like we do - no Dane will be caught eating a full Selection Box for breakfast in December, so they won't feel the need to eat nothing but broccoli for the month of January. They are kind to themselves all year round, which negates the need for the yoyo binging/purging lives we lead here in Ireland. Imagine how much happier you'd be in January if you didn't feel you had to give up alcohol, food or going out - except to drag yourself to the gym to thunder around in Lycra every night. Hygge is about embracing life, enjoying a coffee and a slice of cake without the guilt, not checking work emails every five seconds, having a hot bath, spending time with friends and family. It's about stopping to enjoy and appreciate the small and simple pleasures of life. I may never be able to pronounce it correctly, but I'm all for it. Hygge-me up!